Fracking: Is it safe for Utah? Most wells here use technique, but none is known to poison drinking water. "Fracking" is fast becoming a bad word to critics of the oil and gas industry, but in Utah it's still just a way of business. Hydraulic fracturing  a pressurized injection of sand, water and chemicals to open new pathways for hydrocarbon pumping  has gained infamy with allegations of groundwater poisoning in opening a massive new gas play in the Marcellus Shale formation in the eastern U.S. In Utah's gas fields, though, it has been the norm for decades. "Most all of our wells are fracked," said John Baza, director of the Utah Division of Oil, Gas and Mining. "We've not seen any examples in Utah where fracking is geysering up something else." Environmentalists have said that could be partly because Utah's wells (unlike Pennsylvania's)  are largely on public lands far from homes and culinary wells. Baza believes there's also a greater buffer in Utah's gas well depths  averaging nearly 8,000 feet compared to 2,000 or so in the East  with many rock barriers between the frack target and potable groundwater. In Pavillion, Wyo., the U.S. Environmental Protection Agency tested groundwater after residents complained of well contamination. 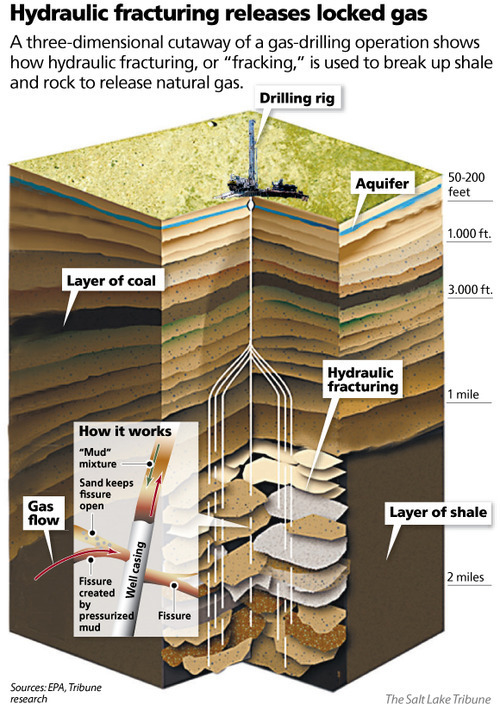 In December, the EPA issued a draft report saying the aquifer there contains compounds likely linked to fracking. The report notes that well locations and depths in Pavillion are relatively close to residential wells. Industry backers have criticized the report, but Wyoming activist Deb Thomas of the Powder River Basin Resource Council said it's clear that gas drilling has contaminated culinary water  including from a well blowout near her home in Clark. She disputes the idea that a well's depth matters, when a leak or blowout can happen at any point of the well pipe or its casing. "If you have a bad casing job or cementing job," she said, "anything you put down that hole is not going to make it to your target." In Pavillion, the EPA's test wells found glycols and alcohols common in fracking fluids, and benzene well above safe drinking-water standards. Federal health officials recommended alternate water sources, which the gas producer Encana has funded for residents. Some states, including Wyoming and Colorado, require public disclosure of a company's fracking chemicals, and the draft BLM rules  leaked but not yet formally proposed  would extend the requirement to Utah and elsewhere. "You need good federal regulation," Thomas said. "The water and air don't recognize state lines. States are making a lot of [tax] money on this. They want the money. You're not going to get a lot of good regulation from [states]." Baza recommends voluntary disclosure in Utah, and he can foresee a time for the requirement if development creeps closer to communities. Many producers already disclose their solutions for Utah wells on the website fracfocus.org. Anadarko, the state's largest producer, lists ingredients for every well, said Brad Miller, the company's general manager of regulatory affairs. Anadarko's wells at its Greater Natural Buttes field in the Uinta Basin reach about 7,000 feet deeper than fresh water, Miller said. "The laws of physics won't allow that fracture to propagate that far." A federal rule requiring disclosure won't hurt, Miller said, but the leaked BLM draft has a troublesome provision: a permit to "complete" fracked wells. This is in addition to the current permit to start drilling. Miller said it could add a bureaucratic layer to slow development. BLM spokeswoman Megan Crandall said it's unclear whether the requirement will be in the agency's final proposal. Companies post individual well fracking fluid ingredients on the website FracFocus.org. Here's the list for the first of Anadarko's listed Utah wells  permit number 43-047-37168  southeast of Ouray, near where the White River meets Bitter Creek. Water and sand combine to make up roughly 99 percent by mass.